For the dough, beat part of the butter until smooth, add egg, lemon zest, and quark. Fold in flour. Cover and leave dough to chill for approx. 2 hrs. For the filling and sauce, wash and prepare strawberries, and set half aside. Puree remaining strawberries and combine with lemon juice and some of the confectioner’s sugar. Press through a sieve for a smoother consistency, if desired. Slightly flour dough and surface, and form a log of approx. 5-cm/2-in. diameter. Cut into equal discs. With slightly floured hands, press one strawberry into the middle of each disc, fold in the dough to encase it completely. Put dumplings into a pot of simmering water and let cook for approx. 10 min. In the meantime, toast breadcrumbs in a frying pan without any oil. Melt remaining butter and add to breadcrumbs. Stir in shredded coconut and remaining confectioner’s sugar. Remove dumplings from simmering water and roll in the breadcrumb mix. 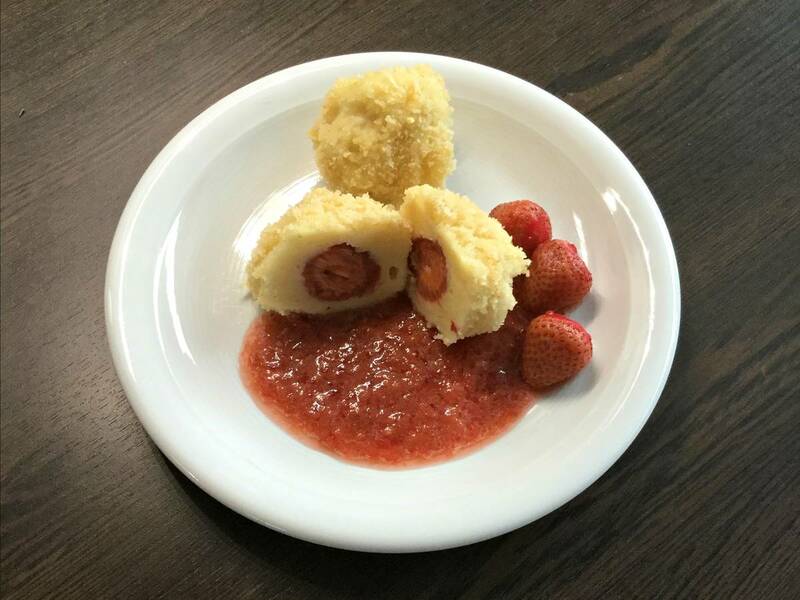 Serve with strawberry puree. Enjoy!